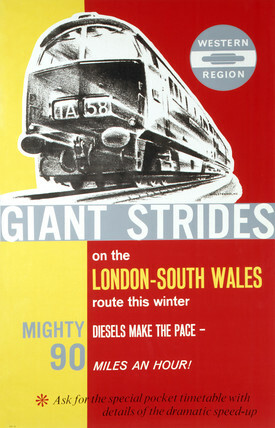 Poster produced for British Railways (BR) to promote improvements in the speed of trains on the London-South Wales route. Trains were hauled by diesel locomotives that travelled at a speed of 90 miles per hour. Artwork by A N Wolstenholme. 'Best in the Long Run - Travel by Train', BR (WR) poster, c 1950-1959. 'The Flying Scotsman', BR poster, 1950. 'The Capitals Limited', BR poster, 1950. 'The Mid-Day Scot', BR poster, 1950. 'The New Midland Pullman', BR(LMR) poster, c 1950s. 'British Railways Locomotives', BR poster, c 1950s.